Anchoring the base of Mount Snow, this ski-in/ski-out hotel is a favorite of families who appreciate its 'back to base'layout. The property features a well-equipped health club and spa and heated outdoor swimming pool. After a day of recreation, guests can unwind in the steam room and sauna, soak in a hot tub outdoors or grab an aprÃ¨s ski cocktail at Harriman's Pub. A quick trip to the on-site deli and store supplies everything a guest needs to prepare dinner in the comfort of their suite. Rooms, studios and suites at Grand Summit Resort Hotel are spacious and stylishly furnished in light woods and cozy leather chairs. All have dining and living areas and well-equipped kitchens with microwave ovens and dishwashers, making pre-ski breakfasts or mid-afternoon snack breaks a convenient option at this ski-in/ski-out property. All units are air conditioned . 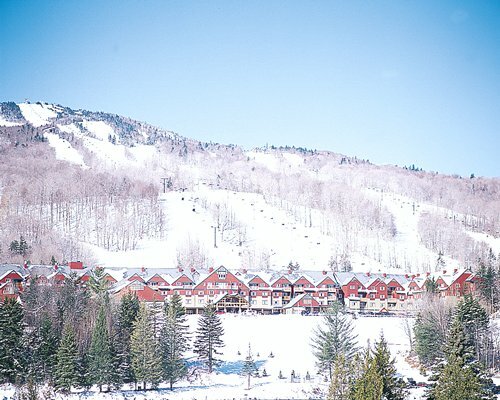 Called the 'Gateway to Vermont', Mount Snow in the Green Mountains has a well-deserved reputation as a four-season resort destination offering top-notch winter skiing and snowboarding on 37 miles of trails, as well as leaf peeking in autumn and hiking, horseback riding and biking in spring and summer. Beyond recreation, the area offers an assortment of family fun, including maple sugaring tours, dog sledding, tubing and ice skating. For golfers, the Mount Snow Golf Course is a premier 18-hole mountain course and has been named one of the top 10 resort courses in the country by SKI magazine. The closest major airport is Harford/Springfield International- approximately 75 miles away. Follow I-91 N to Brattleboro, VT. From there take VT Rt. 9 W to Wilmington. Follow Rt 100 N about 10 miles and the resort turn off will be on the left at the first blinking traffic light. From Albany, take Rt. 7 E (changes into Rt. 9 in VT). At the traffic light in center of town, turn left onto Rt. 100 N and follow above directions.